This data set provides valuable environmental information about Pinus halepensis and Pinus sylvestris plantations in Spain. An array of 74 physical, chemical and biochemical soil (organic horizon and 10 cm topsoil), climatic, physiographic and stand variables from 32 P. halepensis and 77 variables from 35 P. sylvestris plantations are provided. Dataset access is at https://doi.org/10.5281/zenodo.1294607. Associated metadata is available at https://agroenvgeo.data.inra.fr/geonetwork/srv/eng/catalog.search#/metadata/b769554a-2e62-414a-9392-ebd307f0c76f. Pinus halepensis Mill. and Pinus sylvestris L. were extensively used for reforestation of degraded areas in Castilla y León region during the last century. The knowledge about the relationships between environmental factors and stand data in forest plantations can help forest managers to achieve both protective and productive goals for these plantations and are useful for the understanding of the ecosystem functioning (Bueis et al. 2016, 2017). 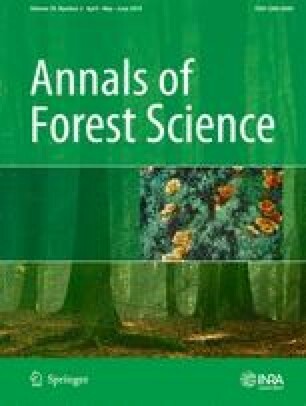 Environmental parameters including climatic, topographic and soil (physical, chemical and biochemical) parameters have proved useful for estimating forest productivity (Aertsen et al. 2012; Afif-Khouri et al. 2010; Bravo-Oviedo and Montero 2005; Bravo and Montero 2001; Bueis et al. 2016, 2017; Corona et al. 1998; Hagglund and Lundmark 1977; Nieppola and Carleton 1991; Pietrzykowski et al. 2015; Romanya and Vallejo 2004; Sanchez-Rodriguez et al. 2002; Sharma et al. 2012). Forest productivity is usually estimated through stand parameters such as the dominant height (the height of the 100 thickest trees per hectare) at a reference age, because it is strongly correlated to wood production (Skovsgaard and Vanclay 2008). However, some silvicultural practices modify the dominant height of the stands leading to underestimation of forest productivity. In those cases, the methods based on environmental parameters are more appropriate (Bueis et al. 2016, 2017). Besides, soil biochemical parameters reflect the status of the soil biological activity responsible for mineralisation and humification processes and then responsible for nutrient availability in forest ecosystems (Bueis et al. 2018b; Yang et al. 2012) and are also useful indicators of health and quality in forest ecosystems (Bloem et al. 2006). The plots of the Spanish National Forest Inventory (SNFI) constitute a very valuable source of information to monitor the evolution of the Spanish forest stands. The SNFI permanent plots are located in the intersections of a systematic 1-km × 1-km grid when they coincide with forest areas. The same measurements are carried out every 10 years including the species composition of the stand, the canopy cover, the age, the diameter at breast height (DBH; 1.3 m) and the total height of the trees, among others. Each plot consisted of four concentric circular plots with 25-, 15-, 10- and 5-m radii, where the trees with DBH higher than 42.5, 22.5, 12.5 and 7.5 cm are measured, respectively. Additionally, in the 5-m radius subplots, the trees with DBH between 2.5 and 7.5 cm are counted. The information gathered in each subplot can be extended to the hectare by means of the expansion factor of each subplot calculated as the area of a hectare (10,000 m2) divided into the area of each subplot. Therefore, the expansion factors are 5.09, 14.15, 31.83 and 127.32, respectively, for the 25-, 15-, 10- and 5-m subplots. Detailed information about the forest stand is collected in the NFI. However, environmental information is scarcely gathered in these inventories, especially the data relative to the soil. The Sustainable Forest Management Research Institute (iuFOR; University of Valladolid and INIA) also has a network of permanent plots in Pinus sylvestris plantations which consisted of rectangular 30 × 20-m plots. These plots have previously been studied to quantify the C sequestration in soils and forest biomass in Pinus sylvestris stands (Herrero and Bravo 2012; Herrero et al. 2016; Herrero de Aza et al. 2011). The 32 SNFI plots in Pinus halepensis plantations included in this dataset are located in the centre of the region of Castilla y León (Fig. 1). The 35 iuFOR plots located in Pinus sylvestris plantations are located in the north of the region of Castilla y León (Fig. 1). Both Pinus halepensis and Pinus sylvestris are monospecific stands originated from afforestation. The geographical location (latitude and longitude), the altitude above the sea level and the gradient (slope) of each plot are shown in Table 1 (SNFI plots; Pinus halepensis), and Table 2 (iuFOR plots; Pinus sylvestris). Soil sampling and stand, climatic and physiographic data collection were done as detailed in Bueis et al. (2016) available at https://doi.org/10.3832/ifor1600-008, in Bueis et al. (2017) available at https://doi.org/10.1007/s13595-016-0609-7 and in Bueis et al. (2018b) available at https://doi.org/10.1007/s13595-018-0720-z. The height and diameter data in Pinus halepensis plantations come from the Third National Forest Inventory (1997–2007) and in Pinus sylvestris stands were gathered in the field (iuFOR plots) in 2010. Soil sampling and environmental data collection were carried out in Pinus sylvestris plots in autumn 2011 and in Pinus halepensis plots in autumn 2012. The diameters of the trees included in both Pinus sylvestris and Pinus halepensis plots were determined by means of a tree calliper in two perpendicular directions and the average diameter was recorded for each tree. The local basal area of each plot was determined with the diameters of the trees in each plot. Tree height was determined with the aid of a hypsometer. The age of each stand was determined through the year of plantation provided by the Regional Government of Castilla and León, which is in charge of the management of these stands. The gradient of each plot was measured with a clinometer, and the aspect was determined with a compass. Soil sampling was carried out in four sampling points per plot, located at a 5-m distance from the centre of the plot in N, S, E and W directions. The forest floor (organic horizon) was sampled in each sampling point in a 20 × 20 quadrant and the 10-cm topsoil was also sampled in each sampling point. Both the forest floor and the mineral soil samples collected in the four sampling points per plot were mixed to get a composite sample per plot. The data set (Bueis et al. 2018a) is available at Zenodo digital repository: https://doi.org/10.5281/zenodo.1294607. Associated metadata is available at https://agroenvgeo.data.inra.fr/geonetwork/srv/eng/catalog.search#/metadata/b769554a-2e62-414a-9392-ebd307f0c76f . The data set cover a file whose filename is Dataset.csv. The file Dataset.csv contains information about the 74 environmental variables studied in the 32 SNFI plots (32 rows) in Pinus halepensis plantations and about the 77 environmental variables studied in the 35 iuFOR plots (35 rows) in Pinus halepensis plantations. The first column (Plot) of the file Dataset.csv identifies the plot and the second column (Species) identifies the species in each plot (1: Pinus sylvestris; 2: Pinus halepensis). Plot characteristics include the gradient in percentage (Slope), the elevation in metres above the sea level (Altitude) and the geographical coordinates of the plots in degrees (Latitude and Longitude). Stand characteristics include the number of trees per hectare in the plot (Density), the quadratic mean diameter in centimetres (Dg), the mean height in metres (Hm), the dominant height in metres (H0), the basal area in square metres per hectare (BA), the dominant height at the reference age (80 years for Pinus halepensis and 50 years for Pinus sylvestris) in metres (site index (SI)), the site quality (SQ) class and the average age in years of the trees in the plot (age). The soil physical properties of each plot include available water (AW), coarse particles (CO), porosity (Porosity), clay content (CLAY), silt content following the USDA criteria (SILTUS), silt content following the international criteria (SILTIS), sand content following the USDA criteria (SANDUS) and sand content following the international criteria (SANDIS), all of them in percentage. The organic horizon–related parameters include the organic horizon thickness in the plot (OHT) in centimetres, the total carbon to total nitrogen ratio in the litter fraction of the organic horizon ([C/N]L), the total carbon to total nitrogen ratio in the fragmented plus humified fraction of the organic horizon ([C/N]FH), the amount of litter fraction in the organic horizon (L) in tons per hectare and the amount of fragmented plus humified fraction in the organic horizon (FH) in tons per hectare. The soil chemical parameters include pH value (pH), cation exchange capacity (CEC) in centimoles of charge per kilogramme of soil, the amount of easily oxidisable C in percentage (EOC), the amount of available phosphorus (AP) in milligrammes per kilogramme of soil, the total N (TN) in percentage, the total organic C to total N ratio (TOC/TN), the amount of exchangeable calcium, magnesium, sodium and potassium (Ca, Mg, Na, K) in centimoles of charge per kilogramme of soil and the water soluble phenols (WSP) in nanomoles of TAE per gramme of soil. Due to the calcareous nature of soils under Pinus halepensis plantations (SNFI plots), the following variables were also studied: the amount of carbonates (Carbonates) in percentage, the amount of reactive carbonates (React_carb) in percentage, the amount of gypsum (Gypsum) in centimoles of charge per kilogramme of soil and the amount of copper, iron, manganese and zinc (Cu, Fe, Mn, Zn) in milligrammes per kilogramme of soil. Similarly, due to the acidic nature of soils under Pinus sylvestris plantations (iuFOR plots), the following variables were also studied: the exchangeable acidity (EA) in centimoles of charge per kilogramme of soil, the base saturation (Sat) in percentage and the amorphous aluminium, iron and manganese (AlA, FeA, MnA), organically bound aluminium, iron and manganese (AlM, FeM, MnM) and exchangeable and inorganic aluminium (AlE, AlI) in centimoles of charge per kilogramme of soil. The soil biochemical parameters include the amount of microbial biomass carbon, nitrogen and phosphorus (Cmic, Nmic and Pmic, respectively) in milligrammes per kilogramme of soil, the amount of mineralisable carbon (Cmin) in milligrammes per kilogramme of soil, the ratios mineralisable carbon to total organic carbon (Cmin/TOC) and microbial biomass carbon to total organic carbon (Cmic/TOC), the microbial metabolic quotient (Cmin/Cmic; qCO2) in grammes per week and gramme of soil, the fluorescein diacetate hydrolysis reaction (FDA) in nanomoles of fluorescein diacetate per gramme of soil and minute, the dehydrogenase activity (DHA) in nanomoles of triphenyl formazan (TPF) per gramme of soil and minute, the acid and alkaline phosphatase activity (AcPhos and AlkPhos, respectively) in nanomoles of p-nitrophenyl phosphate (PNP) per gramme of soil and minute, the urease activity (Urease) in nanomoles of N per gramme of soil and minute, and the catalase activity (Catalase) in nanomoles of O2 per gramme of soil and minute. The climatic parameters include mean annual temperature (MAT), mean maximum temperatures of the warmest and coldest month (MMWM and MMCM, respectively) and mean temperature of the warmest and coldest month (MTWM and MTCM, respectively) in degrees centigrade; total precipitation (TP) and winter, spring, summer and autumn precipitation (PW, PSP, PSU and PA, respectively) in millimetres; potential and real evapotranspiration (PET and RET) in millimetres; mean annual hydric deficit (Deficit) and surplus (Surplus) in millimetres; the Annual Hydric Index (AHI); and the Martonne and Lang Indexes (Martonne, Lang). The validation of the datasets was carried out through a first by hand verification and complemented by numerical and graphical analyses. Laboratory equipment was regularly calibrated, and standards were used on each analysis. Soil analyses were conducted in duplicate and mean values are presented. Every record was revised in relation to the normal range of values for each variable. Related variables were examined and tested for inconsistencies basing on their correlations and corrected when necessary. This original dataset includes forest stand, climate, physiography and soil physical, chemical and biochemical characteristics from Pinus halepensis and Pinus sylvestris plantations in Spain which have already been used to develop discriminant models to predict site index from environmental parameters useful to carry out sustainable forest management for stands. Climatic, physiographic and soil physical and chemical parameters are usually included in this kind of models. However, soil biochemical parameters are seldom included, even when soil microorganisms play a key role in soil quality and productivity (Bueis et al. 2016, 2017; Gartzia-Bengoetxea et al. 2009). They have also been used to assess the differences between the enzyme activities in the contrasting soils under Pinus sylvestris and Pinus halepensis plantations and to trace those differences back to edapho-climatic parameters to determine which environmental factors drive enzyme activities in these soils (Bueis et al. 2018b). This information is useful to state managerial proposals for improving enzyme activities and, as a result, improving nutrient availability in forest soils. The inclusion of soil information would increase the potential use of the information in the SNFI (Alberdi et al. 2017) and iuFOR networks. Highly remarkable are the synergies between the information contained in this dataset and the information related to the forest stand available for the iuFOR and the SNFI plots. These complementary sources of information present combined interest because of their potential to unveil many aspects or dimensions of forest ecosystem functioning in Pinus plantations in Spain (Alberdi et al. 2017; Bueis et al. 2018b). The authors thank Cristóbal Ordóñez, Elisa Mellado, Temesgen Desalegn, Olga López and Carlos Alejandro Mendoza for their assistance in the field and Carmen Blanco, Juan Carlos Arranz and Adele Muscolo for their advice in laboratory analysis. This work was supported by the University of Valladolid and Banco Santander (predoctoral grant to T. Bueis), the Mediterranean Regional Office of the European Forest Institute (EFIMED; “Short Scientific Visit” grant to T. Bueis) and the Ministry of Economy and Competitiveness of the Spanish Government (AGL2011-29701-C02-02 and AGL2014-51964-C2-1-R).